Star Wars: The Old Republic players will soon be able to go adventuring with a heavily-armed sentient teddy bear. There's nothing better to have at your back when the Emperor's best troops are bearing down on you than a gang of primitive, sack-wearing cuddly-wuddlies, which is why the addition of Treek the Ewok in the 2.3 patch will be such exciting news for players who find Wookies to be just a little bit too soft and delicate for their liking. 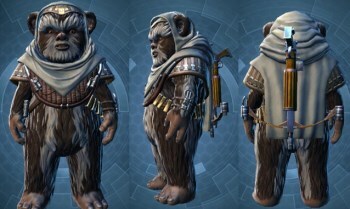 Treek is a heavy armor user who can employ both heal and tank stances and Aim as her primary stat, who will be available via a droid at the Cartel Bazaar once the patch goes live. Her contract will cost a million credits and require legacy level 40, but a Cartel Coins option will be available for players who find themselves a little light in the credits department. A more detailed breakdown of Treek's stats and a few apparently-spoilerish cut scenes introducing the character can be found at Dulfy.net, but what more do you really need to know? This is an Ewok, the galaxy's most perfect predator, and she's willing to work for you! That's can't-miss stuff, people. The Star Wars: The Old Republic 2.3 patch is running now on the Public Test Server.